This week more of the mystery of Class 3-4 is revealed, testing our theories about what’s going on, while Ai is caught between two people with differing goals hoping to enlist her aid, when all she wants is a resolution amicable to all parties involved, which may not be possible. Turns out we were right about Dee falling out that window, but it wasn’t her wish for what ultimately became the timeloop; it was the rest of the class. After that, for fourteen years she stayed by the side of Alice, someone she knew was a nice guy but had barely spoken to before her fall. So here we have Dee desperate to keep the looping world going, not only because she doesn’t want to disappear, but because she wants to keep living in a world with Alice, even if she doesn’t deserve to have him return her feelings. She’s so desperate, she even killed Alice many loops ago in hopes that his need to break the timeloop would reset when he respawned. Instead, he was granted Buzzer Beater, which made his passion of basketball a meaningless bore, since he could never miss again. And he continued to save the world—the only world where Dee could remain alive—by destroying it. We hear much of this from Alice’s own mouth, both in narration and in an initially tense scene in the library with Ai, when we’re not sure just how far she’s willing to go to maintain the status quo. And while Alice considers her “the enemy”, she doesn’t come off as a villain at all; she’s just trying to survive, and doesn’t want Alice, someone whom she’s fallen in love with, put in the position where he’d make any sacrifice to save Class 3-4, since that would make her “useless” to him. In any case, we’re sympathetic to her cause, selfish as it is, and so is Ai. No, Dee’s no villain; if anything, she’s a victim. For one thing, someone really should have been spotting her on that tall ladder. Secondly, the class made the wish, not her. 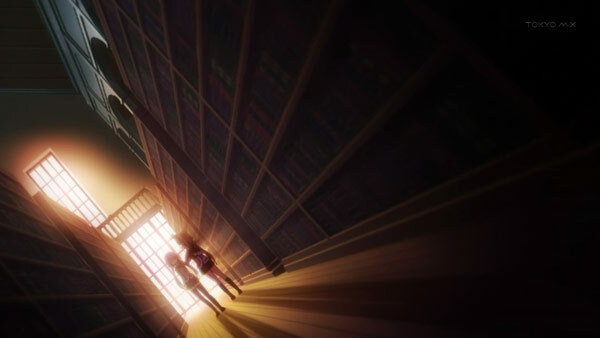 Thirdly, barring the magical cure-all solution Ai holds out hope for, things don’t look good for Dee or the status quo, as the very presence of Ai in Class 3-4 is gradually destabilizing the false world, drawing it closer to collapse. Alice remarks that granted wishes keep people from moving forward, but it’s small comfort for someone like Dee who literally can’t. We’ll see in the final outing if Alice means with he says, and after fourteen years with Dee, if moving forward is worth her sacrifice.